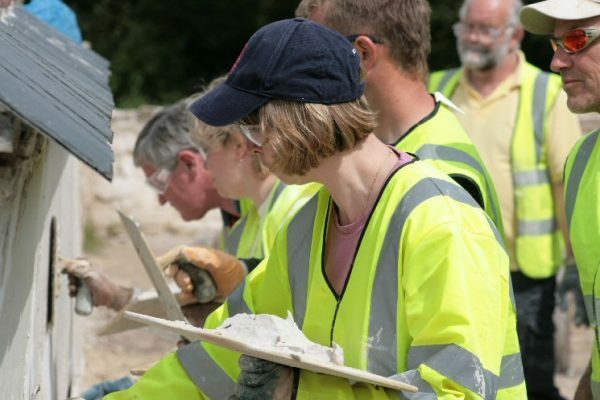 Since 1996 over 3,000 home owners, builders and professionals have come on our Practical Lime Course to gain hands-on experience in using lime mortars and lime plasters for the repair and maintenance of traditional buildings. Our approach is to create a relaxed environment on where you will enjoy learning, with ample opportunity for discussion in the breaks. Course numbers are limited to ensure individual attention by two course leaders. For each session there is a practical demonstration. You will then be encouraged to have a go, with guidance at hand. All tools, materials and personal protective equipment are provided but please bring protective outdoor clothing and footwear. You can purchase materials on the day of the Practical Lime Course. You will also be entitled to a 10% discount on all future purchases from our range of traditional lime putty products and tools. For further information or to book, call our office during opening hours and make a payment by card. You can also make an enquiry online by selecting ‘ADD TO QUOTE’ and pay into our trading account by bank transfer. 100% of our recent Practical Lime Course feedback forms rate the course as either ‘great value’ or ‘good value’. “I was extremely impressed that there was no sexism at any point – what a relief! I could relax and enjoy the course and take it all in.” Rose, 8th April 2016. “Whole day really enjoyable and informative. Great to learn so much and for it to be so interactive and hands-on. I feel much more confident in getting stuck in on my cottage now.” Jezz, 8th April 2016. “Best fun since playschool!” Stefan, 18th March 2016. One day, with lunch included. We cover the traditional skills for repairing and restoring with lime mortars, renders, plasters and limewash. Up to 12, with individual help from 2 course leaders. £144.00, including lunch and VAT. Call the office during opening hours and make a payment by card. You can also make an enquiry online by selecting ‘ADD TO QUOTE’ and pay in to our trading account by bank transfer. Your place will only be confirmed once payment has been received. Select dates from the drop down menu at the top of this page. Why are they usually on a Friday? So you can enjoy the wonderful Devon countryside and coast and make a break of it.